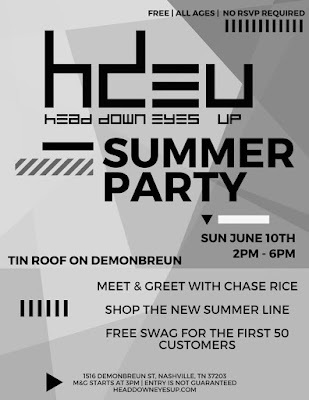 Chase Rice Announces Heads Down Eyes Up Summer Party During #CMAFest! Chase Rice will greet fans while promoting his "heads down eyes up" brand with a party at the Tin Roof on Demonbreun from 2 PM - 6 PM on Sunday, June 10, 2018. The meet and greet will begin at 3 PM and is free and open to the public.